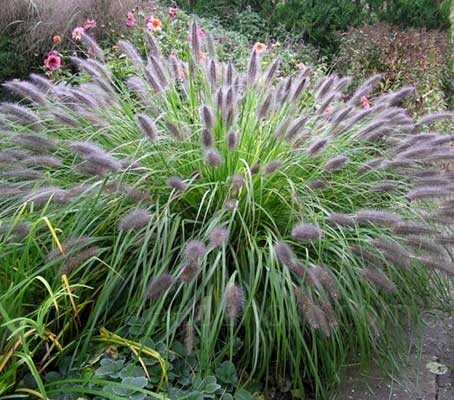 Pennisetum is one of the most popular ornamental grasses for the garden. It is one of the easiest and most visually stunning grasses you can grow. Pennisetum alopecuroides is an especially appealing species, it changes its appearance and colour throughout the growing season showing an interesting aspect even when the peak flowering time of other plants has ceased. Pennisetum alopecuroides var. viridescens is a beautiful variety that is commonly called Black Fountain Grass or Dwarf Purple Fountain Grass. It has broader leaves and darker flower heads than the regular species and, growing to around 60cm (24in) tall, it is also slightly smaller. In late summer graceful fountain-like smoky purple-black plumes emerge in profusion and contrast nicely with the slender arching, glossy, deep green foliage. As the seasons progress and the late autumn frosts begin, the green foliage turns beautiful shades of yellow, chartreuse and amber. The plants add interest and structure to the winter garden as well as seed for birds, while the inflorescences are valuable in flower arrangements. Pennisetum alopecuroides prefers a position in full to partial sun, with consistent moisture and with good drainage. The plants are somewhat drought tolerant once established, will grow in a range of soils and tolerate both wind and salt spray. It can be planted in the border, used in containers and rockeries, and is suitable for damp areas and at the edges of ponds. The plant is a fairly tender perennial and is often grown as an annual. It is hardy down to about minus 7°C (-22°F) so in colder areas if planted in a sheltered spot, may survive the winter, otherwise it can be grown in large pots and moved to a cool greenhouse over the winter months. With slender arching leaves that create a linear texture, it is one of those plants that maintains a distinct yet subtle presence wherever it's used. One to three plants are effective in small gardens as an accent, and in larger areas, mass plantings are absolutely stunning. Sow on to the surface of a free-draining, moist seed-sowing compost and cover with 3 to 4mm (¼ in) of vermiculite. Keep at around 15 to 20°C (60 to 68°F) Germination should take place in approximately two weeks. Plant out in sun and in well drained soil. in rows 60 to 90cm (25 to 35in) apart with a distance of 10 to 30cm (4 to 12 in) between the plants. The rate and speed of germination will depend on the soil temperature and weather conditions and could be from seven to twenty one days. Cut back old foliage in spring as new growth appears in the centres of plants. Feed in summer with single dressing of a dilute general fertiliser. Even without an annual feed, most grasses will put on a first-rate show. The more nitrogen grasses receive the greener and further they'll grow. Do not over do it…their spreading habit is fine in a field, but in a garden they may become too lush and the flower quality may suffer. Pennisectum can be dried and make interesting focal or secondary flowers in dried arrangements. To dry, cut the flower at the height of bloom and hang upside down in a cool, dark place to dry. Beds and borders, City, Containers, Cottage/Informal, Foliage only, Prairie planting. Flower arrangements. Low Maintenance or Mediterranean. Pennisetum alopecuroides is native throughout eastern Asia where it can be found in open lowlands and grasslands. Its distribution ranges from tropical Queensland to the south of New South Wales mainly along the coast. It naturally occurs in moist conditions in flats below watercourses and in boggy areas. Pennisetum are generally commonly known as Fountain Grass and because it naturally occurs in moist conditions Pennisetum alopecuroides is occasionally known as Swamp Foxtail Grass. Pronounced pen-nih-SEE-tum al-oh-pek-yur-OY-deez. Synonym: Pennisetum compressum. Light, moderately fertile, moist but well-drained soil. Tender Perennial treat as an Annual.